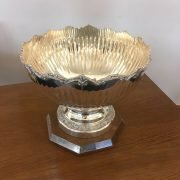 The winners of the two sections of the Carols’ Trophy have now been decided. After some very tight matches, Gullane won by 2 points over Kilspindie and Musselburgh tied with Gifford on points, but won on games won by 12 games to 10. The two winners will now play each other to determine this year’s winners of the Carols’ Trophy. Well done to both team on winning their sections and commiserations to those pipped at the post. We now have the finalists for this year’s Hole & Hole competition, Nancy Thorne and Anne McAllister. We hope you have a good match and look forward to hearing the result. The full results can be found by following the following links. You can see from the photographs that Luffness looked stunning and that the rough had benefitted from some rain. It was unusual to play one of the links courses with so little wind but the greens were well protected by bunkers that made it a difficult day for some. A large number of volunteers helped with the running of this event and thanks are due to them. On a lighter note you may have noticed the “Tilted Toilet ” on the course a rival to The Leaning Tower of Pisa. After a few windy and/or wet days the sun came out (eventually) and 140 ladies had an enjoyable day in the clubhouse and on the course at Luffness. There were some great scores and some not so good. The course was in great condition but the rough and bunkers could be punishing. Full results and some photos will follow. Well over £4000 has been raised for Macmillan Cancer Care. The final figure will be confirmed shortly. 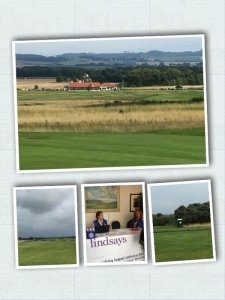 Many thanks to all who supported the event especially Luffness New Golf Club for allowing us the use of the course and kept us all fed and watered and Lindsays solicitors who covered the prizes and some expenses. As the summer golfing season draws to an end it is time to start thinking about Winter golf. We are now accepting entries for the Winter Foursomes which will run from the 1st October 2018. To enter simply email ellcga2@gmail.com with the name of your partner and the preferred contact number or numbers for the draw. If you do not have a partner let us know and we will try and pair you up with some one. Entries will close on the 16th September and the draw will appear on the website a few days later. Very windy conditions at Kilspindie meant that the first 9 holes were hard to score on, in fact if you hadn’t lost a ball you were doing pretty well. Some groups escaped the rain while others had their rain gear on and off several times. The course was in excellent condition as ever and all players seemed to have enjoyed the day. The course analysis showed that the second hole was the most difficult, I don’t think that is a surprise to anyone. Given the conditions there were some excellent scores, Alice Archbold scored a well earned 41 points in the morning and in the last group of the day special mention must go to Alyssa Balding who had 5 birdies, 8 pars and 2 no scores in her 40 points. The full results can be seen by clicking on the pdf files below but the for a quick summary -there were 90 players and the CSS was 69. Liz Grandison (1st); Elinor Blair, Hazel Saunders, Morag Nicholson (8th); Alice Archbold (10th); Helen Seward, Alyssa Balding (13th), Audrey Berg (18th). This year for the first time we entered a team in the East Lothian Junior League Team Stroke play event at Royal Musselburgh. ELLCGA were represented by Lucy Hall, Abby Nisbet and Ala Gorka. The Gullane Team won the Scratch with 230 and Haddington the lowest net score with 208. The ELLCGA team were 245 gross and 210 net. The best individual net scores were Ben Austin from Haddington with a net63 and Abby Nisbet with 64. Our President, Janette Buchanan who was at Royal Musselburgh to watch the juniors was invited to present the trophy and prizes. Well done girls and especially Abby with a wonderful personal score and contribution to the team total. Our final golf event of the year. Some might say a bit early for an Autumn Meeting but “the nights are fair drawing in” and if we leave it any later in the year we would not be able to offer late afternoon times. click on the links for the draw and for the notes about Kilspindie. Note:- as you are aware we co-ordinate the Babe Zaharias Competition which is being held at Luffness New on the 20th August. The event is full but we are looking for donations of bottles for a tombola this year. If you would like to make a donation please bring it along to Kilspindie. Finally if you ordered a gilet or polo shirt these will be available at the Autumn Meeting. The weather may be just a little cooler but things are hotting up elsewhere! First of all congratulations to North Berwick on winning the Dewar Trophy in the 5 a-side scratch league with 7 points narrowly edging out Dunbar on 6. Over in the Carols’ Trophy Gullane Ladies lease their section but it is not done and dusted yer with a few games still to be played. Musselburgh lead section 2 at the moment but Dunbar have a game in hand and play Gifford on the 19th. Meanwhile we have reached the semi-final stage of the Summer Hole & Hole competition and the line up is Anne Blundell v. Nancy Thorne and Anne McAllister v. Kelly Foley. Well done in reaching this stage. Have a look at the Junior News section to see what our juniors have been up to. The Draw is now complete and pdf and excel versions are below. Please also read the attached notes regarding arrangements at Luffness. If your circumstances have changed and you can no longer play please advise Jane Nelson as soon as possible since there is a waiting list. We look forward to welcoming everyone to Luffness and we will be keeping our fingers crossed for a fine day.